ZUCA Silver Shimmer Insert & Frame. 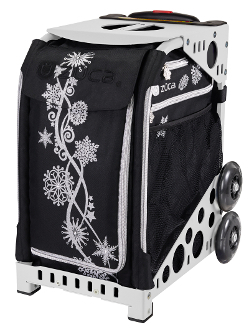 Rink-side style is just as important as your look on the ice, which is why Zuca designed Silver Shimmer with silver trims and a whimsical winter wonderland-inspired motif. There is plenty of space for your skates and accessories. You can use them to haul all your gear and you can sit on them when seating is limited at competitions. Can also be used as weekender bags when you purchase the Pro Packing Pouches.